Welcome to another edition of Man Behind the Clouds Fan Mail! The concept is quite simple, I read and respond to questions from my beloved fans. What are your thoughts on LeBron and the race factor? Some people love him, while others love to hate him. Ever since jumping from high school to the pros, LeBron James has been at the center of controversy. With his “decision” to take his talents to South Beach and leave Cleveland in the dust, LBJ has succeeded at tarnishing his image. However just when you thought it couldn’t get any worse, LBJ decides to play the race card as one of the forces behind all the media backlash he has received. Please keep the camera on me at all times! First of all let me start off by saying that everything you are about to read are just opinions of mine. Nothing more nothing less. With that being said, I believe LeBron was wrong by using race as the reason behind all the criticism he has received from the media. I think athletes like Michael Vick or hell even Tiger Woods would’ve been more suitable candidates than LeBron to use the card. First of all, the media and the fans are so upset is because you abandoned the team you helped rejuvenate. Combine that with all the loyal fans that have supported you through the years can create a lot of animosity. I mean call me crazy but many people see that as a slap in the face. Glad I don’t hail from Cleveland. All this talk about whether or not he is staying or going would’ve been too much for me to bear. No matter the context people do not like to be strung along! My last argument is that the media hates egos. Unfortunately many black athletes are instilled with “cockiness”. But LeBron took his ego and made a ESPN special out of it. While the proceeds went to help support the Boys and Girls Club, I think that LBJ could’ve raised money in other ways rather than using your free agency announcement as your platform. Trust me I understand that at the time King James was the most coveted free agent since the inception of free agency. But c’mon, you don’t need to make a state of the union address out of it. While I do believe that minorities are always under intense media scrutiny. However race certainly did not play a factor for all the “heat” LeBron was catching for leaving to play for Miami. I mean imagine that free agency was a big deal back in the 80’s? You don’t think that all the white people in Boston would’ve reacted the same way if Larry Bird decided to go play for the Lakers? You bet your short shorts they would have. 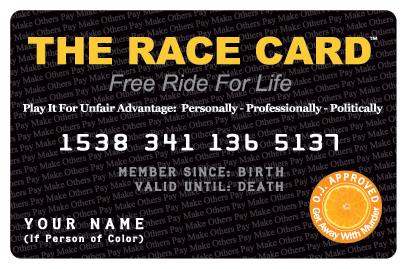 So stop playing the race card LeBron. It’s because of your own actions and decisions that people are pissed off with you. If I have a terrible season it is because of my race!